Brass and Ceramic Fire Bowls installed at Tappan curated by Chelsea Neman. 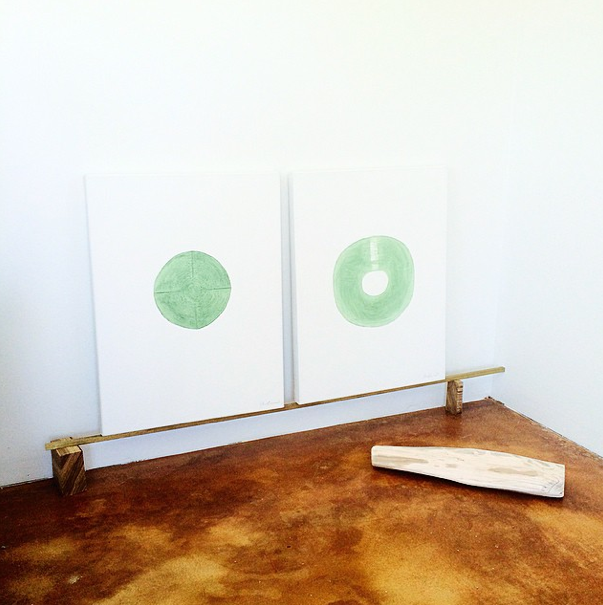 Mineral Paintings installed at the Soho House as part of group show curated by Chelsea Neman of Tappan. LEGENDS OF THESE LANDS LEFT TO LIVE Vinyl Available. Also, available digitally via iTunes, Spotify, Tidal. Read Reviews by NPR, STEREOGUM, VICE/NOISEY, and others on music page. VIDEO PREMIERE on VICE / NOISEY for my song Walk this Earth. Read the full review here. My song STONE FOX was featured over at Songs We Love on NPR. To give it a listen and read the review click Here. 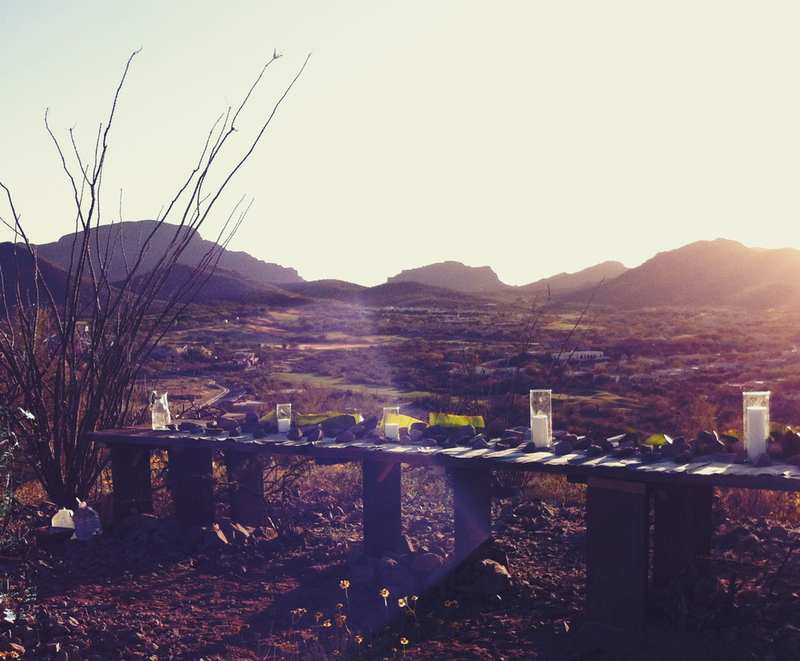 30' x 30' x 28"
Site specific sculptural table built into the Sonoran desert - breaking the horizon, continuing the road. Hand carrying 30 foot oak beams up to the top of a Tucson Mountain through the raw desert was arduous and mythic for a team of 4. To celebrate the final build, an inagural party was thrown at the top of the hill as an ode to Gordon Matta Clark and Carol Gooden’s famous project Food. Reflections in Artifacts focuses on creating works based on primitive methods, philosophies, technologies and artifacts. There are so many ways of knowing and we are left only remnants. The series is intended to be in dialogue with the strong connection that runs through the endeavors of human beings and the many ways of knowing. Photograph from Travels. Mumbai, India. My Song STONE FOX featured on You’re the Worst, on FX networks. Featured in Range printed publication - written by curator Corrina Piepon, as well as on Ignant next to Christo and JR.
Pray for Rain was inspired by the Kula Ring in the Massim Archipelago and many other gift exchanges of primitive cultures and aims to gift exchange with the earth - a return of these life giving waters for evaporation back into the cycle of water at the end of monsoon season in Arizona. Installing the pools into a remote hike in location in the Sonoran Desert was arduous and mythic. Hand building the sculptures over the course of several weeks, hand carrying them into the desert, sourcing water and hauling in rain to be returned to the earth. Invitees were given a map, to drive to the remote location and then hike in a mile to come to the art opening. The ceremonial aspect of the work began at dusk, unbeknownst to the attendees. This performance was inspired by a conversation I had while recording with the Drum group AFI in Cape Coast, Ghana in 2009. Kweku, the bandleader, and I talked about how their ancestors would use drums to communicate distances. I was excited to recreate this experience for those present. The mountain at the location talked back during the performance. The echo was at least a whole second delay. By the end of the performance it was last light and the full moon just rising. The drummers throughout the landscape created an intimidating and cacophonous drum experience. The ceremony continued using lights and the familiar fragrance of the creosote desert plant released by rain. Featured in New York Magazine’s The CUT, talking about my new record, my sculpture work and the ethos of what it means to be authentically American. Click here to read the whole article. Light Sculpture installed into a dried rushes field that attendees were invited to meander through. The sculpture revealed itself as the sun set. Reflection in geography, as the sun sets creating an isolated area of vegetation in a desert, surrounded by the approaching darkness, hinting at mythology and an inner sense of calm and the imagination that happens in vast and dark open fields. 6' x 22" x 12"
The 36th Hour of my long winded stay, rotary style on grassy pasture, surrounded by whims of cattails, local hollering, bright skies, crisp weather, a diverse reach of ranchers and earth ecstatic rugged life-folk, I found myself birdman style snaking through ponds filled with various valuable, murky, and beautiful reeds on one of those hot Idahoan mornings. Fresh, mossy and extraordinarily clean. I was taking a knife and a fairly sharp one at that, grabbing the Tule reed at its base, telling the reed, this is going to hurt and thanks in advance in case that helps. Lining the knife across at a diagonal angle and cutting the stalk free of the root. I stacked the cut reeds in various places afloat throughout the pond. Miraculously, yet unsurprisingly the bundles floated around me contentedly showing off their inner layering of hollow, yes, hollow reedlike buoyancy. I carefully meandered so as not to take too much from each patch and spied the duck hunters camo-ing up in the mud patch across the way. I laid the rushes in the sun to dry. A native Hawaiian, who came to California years ago to teach primitive skills, showed me how to lash the reeds as the Ohlone of Miwok Bay had done to make their fishing boats. 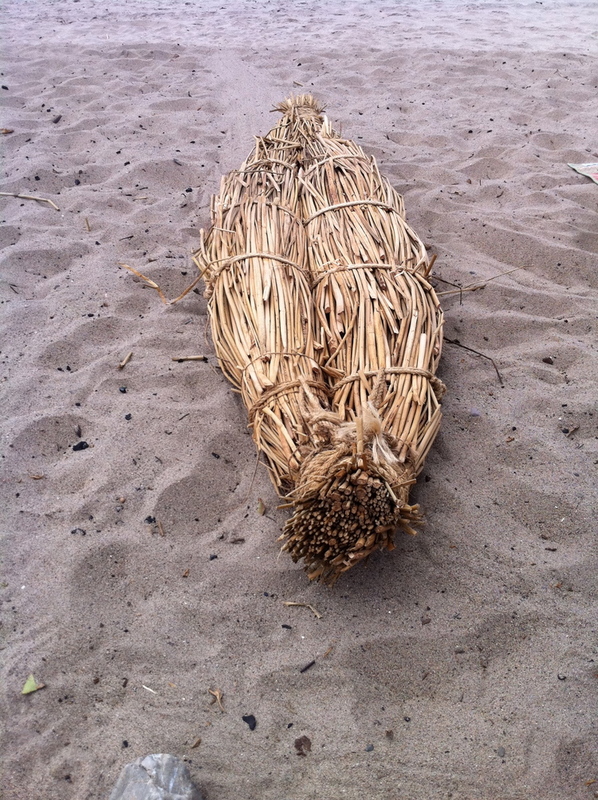 Because of my love of surfing, we lashed the reeds together with two bundles and shaped them with rocker and tail. Traveling on the road, through midnight skies, torrential rains, game commissions, in and out of houses, piled into and on top of the car, this now beatnik symbol came to reflect so accurately and intertwine among trips to the beach and new ventures in surf lifestyle. Stopped by agricultural control at the border of California to check that the rushes had dried. We made it down to the Southern California coast and put it out on the water. available via Tappan Gallery in Los Angeles. Totem to those individuals who exemplify what Hunter S. Thompson was talking about when he spoke of ‘Mould Breaking Heroes; Living proof that the tyranny of the rat race is not yet final'. Inspired in part by an ex-San Francisco surfer who paddled around Kauai on a 9.0 surfboard, sleeps in a beach cave, and fishes his own food – and other like surfers and vanguards out there surfing/living for the love of life and true hedonic spirit. 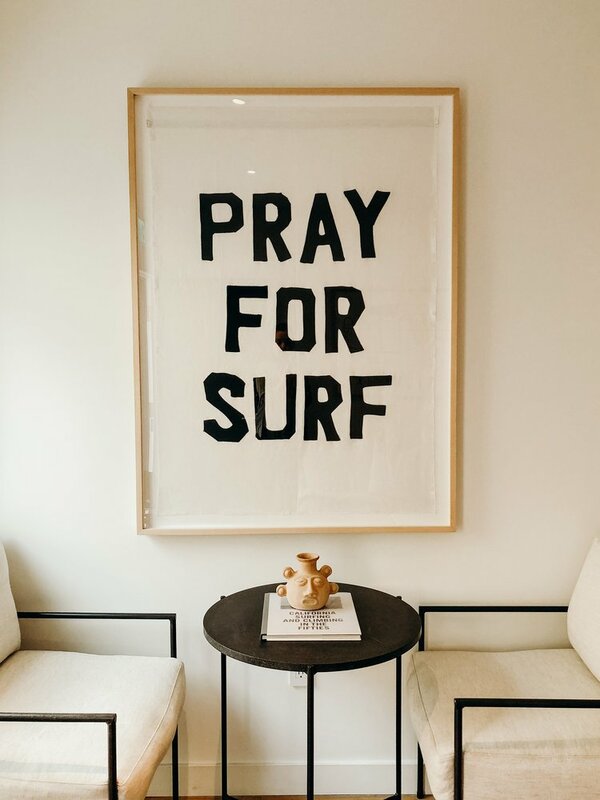 Pray for Surf hangs in the collection at the Surfrider Hotel, next to the prints of Le Corbusier. As celebrated on Vogue Paris, Goop, Llony Domaine Homey and Rip & Tan. 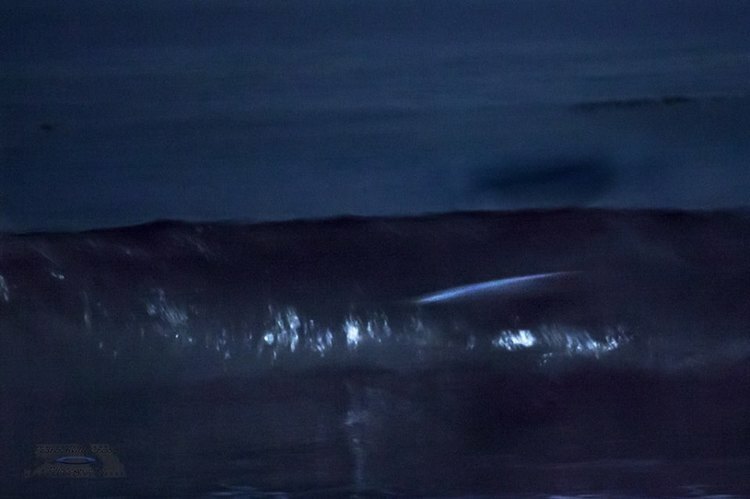 Full Moon Surf. Taking a break to connect with the cosmic. Pray for Surf Flag hanging in Surfrider Hotel, next to Le Corbusier prints - as seen in Vogue Paris, Goop, Rip & Tan. Flags available from Tappan gallery in LA. I have a painting available in the Venice Art Walk for Sale, alongside some brilliant artists - Billy Al Bengston, John Baldessari, Barbara Kruger, Kristy Campbell, and many others. Please come out. 100 percent of the proceeds go to support the Venice Clinic. Photograph from Travels. Murudeshwar, India. 70' x 10" x 10"
The Mojave Desert is a place the American psyche has turned it’s heart to, a unique place in our personal mythology. The poetry of the harshest and most rugged terrain upon which some of our go west, rugged individualism, survivalist identity has been formed. The vastness, the quiet, the trackless landscape. The playas, dried remnant of a prehistoric time are symbol to the ever changing, and the slow timescale of the earth. There is an open story of abstraction and projection alongside the prehistoric remnants that makeup the Mojave. This famous California desert has the perfect intersection between off-road culture, speed trials and earth art, both in it’s history and also it’s present. I was inspired, and I wanted to work on a sculpture that dialogued with this mythopoetic space. It only seemed fitting to create this piece out in the backcountry, taking a journey and setting out to see if I could find one of those iconic vast Mojave canvases that was that was blank, unpaved, off road and not accessible by anything but bike. This place existed in my mind, but I had to go find it. Riding out into backcountry is tough. You aren’t really going fast. You’re in soft sand and picking your way through it. We were riding vintage enduros back there. And one of the bikes was from ’74. These bikes are different, they are heavier and they don’t handle like a modern dirtbike. But that’s the way it is out in the wild. Everything depends on you, having enough water, knowing how to read the weather, how to backtrack and know your orientation, how to stay warm, make your own light and so on. That is survival, you really have to learn to depend on yourself, but that feeling of independence, and ultimately interdependence with the earth, is really in my opinion, one of our most fundamental powers and a very real source of joy. We were all packed up over the back of the bikes. And that’s why I love those bikes - they are tough and well built and you can take them anywhere. 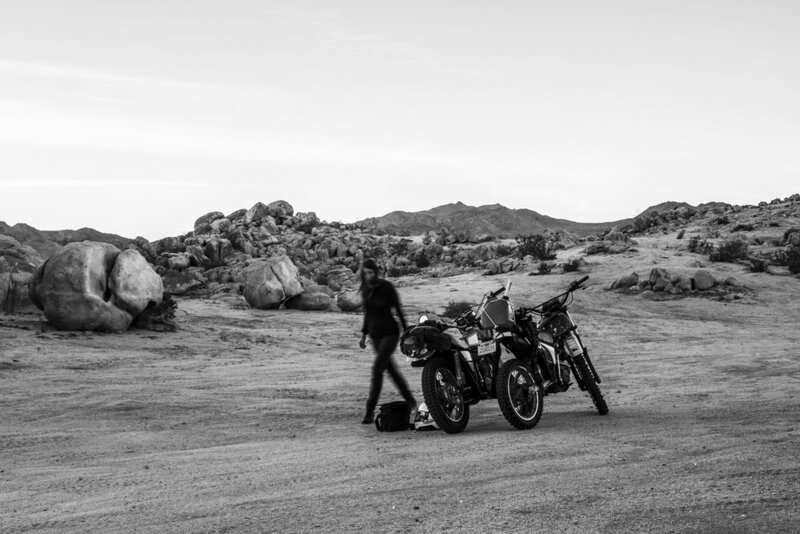 The whole world is there for you to roam and in the desert - it’s pretty wide open - so you can ride anywhere. We were picking over rocks and into new territory. We were riding on backroads and dried lake beds. We spied this small passageway up and through the rocks that we could slip through. Just through this rock crevice canyon was this phenomenal natural amphitheater, bowl shaped enclave, hidden. It was dusk, so we unpacked to the sounds of the coyotes down in the playa below. Most of my art practice is based on getting us back in touch with some latent instincts that I think we left out there in the bush. While we were riding during night fall, we really got that sensation of the wide open blank vast space, the giant infinity around us, and the open sky. That’s not an intellectual experience, its a sensual one. No matter which direction, you are riding toward a horizon, something far and ahead of you that you can’t see. You are making a perpendicular axis, dividing the circular earth with parallel lines, dividing the circle boundary of your range of vision. You sort of spread out over the land spatially. You start to think of yourself separating yesterday and tomorrow and there’s a relationship to speed. It felt as though we were out there in the middle of nowhere cutting the day and night in half. Human beings are a gold mine. Boldness, backcountry, riding, sensual experience that goes out beyond your skin, loudness, speed, these aren’t just concepts, these are lifestyles. 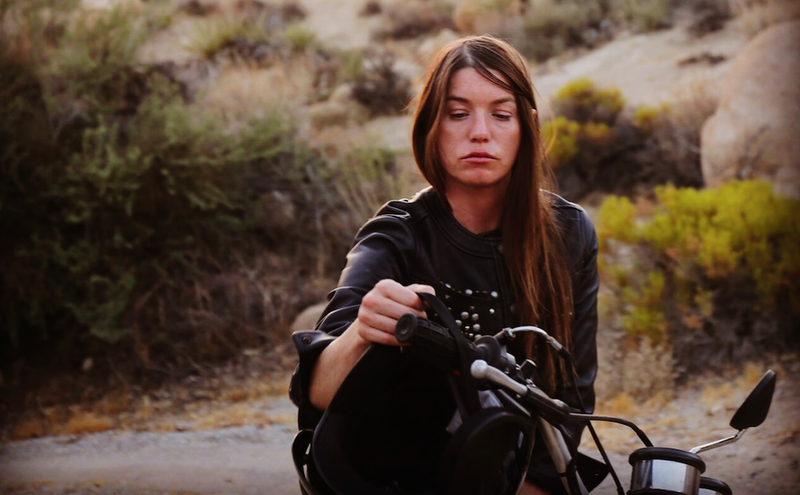 Sometimes you have to burn a blaze, or head out into the middle of nowhere, or ride desert at night, to enliven your sensuality. You are a shapeshifter and you’ve got the power. It’s ancient, it’s in your skin. New interview over on Cicada Wheels, discussing music and my recent art project. Click here to check it out. Cover Feature of La Motocylette - debuted at MOCA, Los Angeles. Humanity feels the liveliness, archaism, and the elemental beauty of fire naturally. It really doesn't take much provocation in an artistic sense. The eloquent movement of the flames in the wind, or the speaking of the fuel turning to ash when drawn near to it. The mysterious movement of light illuminating, reflecting cast onto, around and prohibited by the sculptural dimension of space and material that surround, creates a reflective and mesmerizing calm that so many of us sense as part of our evolutionary history. 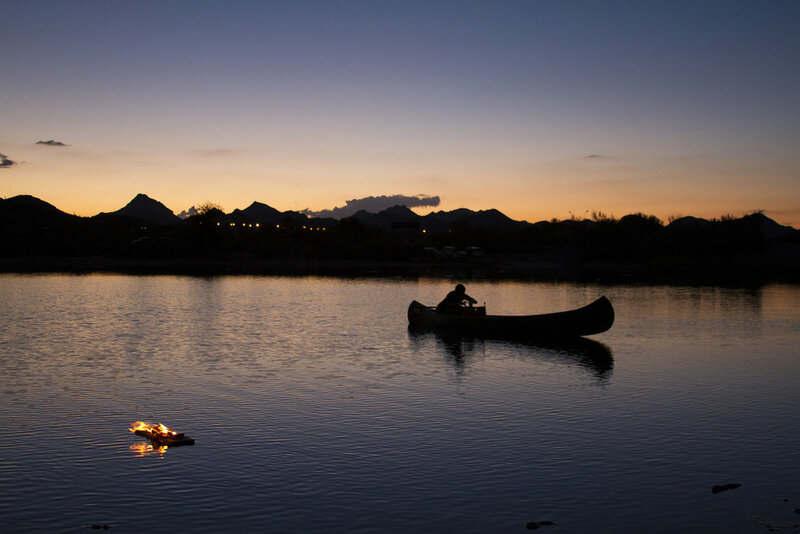 Canoe Fire was a series of many small fires I floated onto a lake in Arizona to create a sculpture which moved and floated in the wind and the water. The ceremony was exquisitely beautiful. The fourth of my Installation series for the Mojave. Always showing the same face, synchronous rotation, our only satellite, surrounded by a trace of infinite dust. Waxing and Waning the formation of the most ancient calendars. Over the course of the Lunar cycle, from New Moon to New Moon - the course of 29.6 days, patterning the phases. 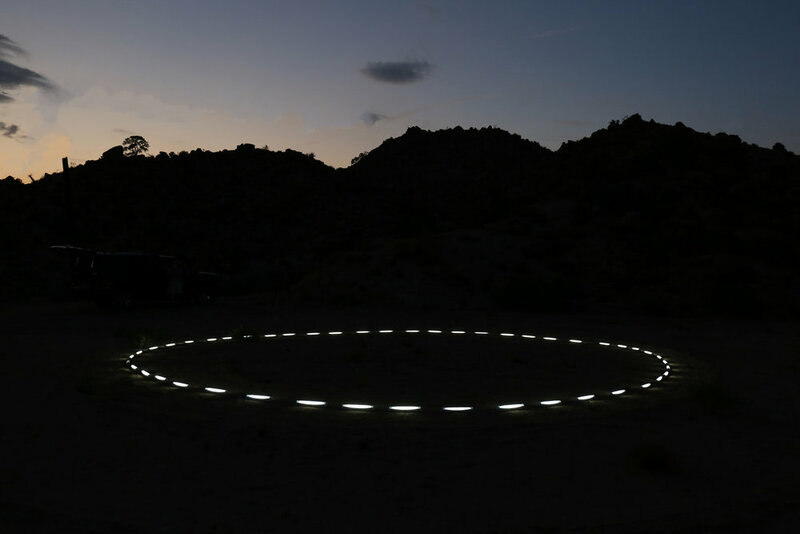 Lighting up the the phases of the moon peacefully, from a hidden plateau in the Mojave desert. Ancient ritual, and symbolic parts of self, as rising and setting with the moon, however only revealed as the night falls to dusk. Circular in nature, but remaining parts, illuminated and drawn into Jungian shadow. Relevant and reflected into the sky. Our entire history of architecture is rooted in gravity. 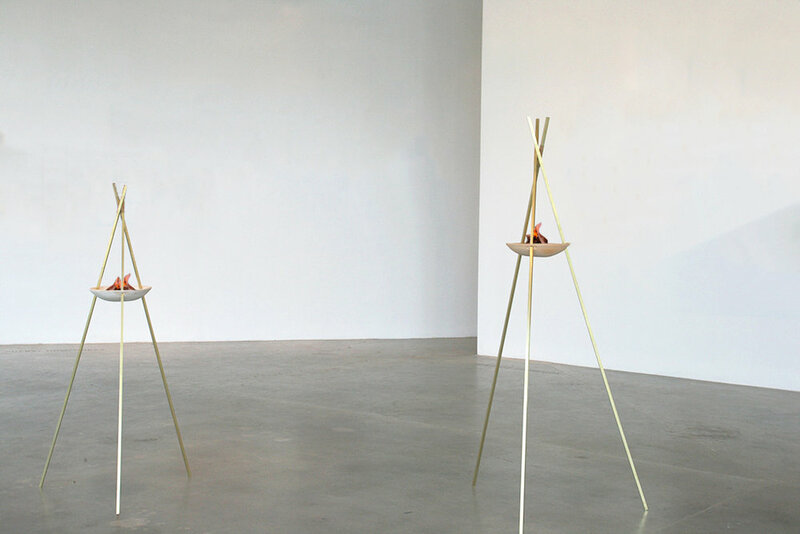 This collection of sculptures is a study in balance and structural integrity from a sensual and muscle memory-type perspective. Thatʼs the beauty in these structures - thereʼs a study, but one that must be expressed and understood sensually or physically, not solely intellectually. The engineering is more felt and sensed. And that sense of balance extends out to our own sense of balance. There is a communication between an unbalanced or tenuous structure and our own inner sense of balance. These structures aim to create a sensual form of movement, and transposition, while elegantly holding their structural form. Invited to create a site specific sculpture for the Joshua Triennial curated by Metacurator and Boxo Projects. I built a Light Sculpture into the boulder field for invitees to hike through. The sculpture revealed itself as the sun set. Installed at Boxo Projects in Joshua Tree as part of the Joshua Tree Arts Festival curated by Boxo Projects and Metacurator. While working on several large-scale sculptural works in Arizona I started the mineral painting series as a gallery analogue to the work I was doing out in the field. Painting with the mineral rich earth and hidden deposits beneath our feet with their intense array of color, beauty and innate worth was an excellent way to bring my Earth Art Ceremonies into the gallery and collector’s homes. The mineral paintings series was inspired, alongside my other recent works, to focus on a primitivist and archetypal perspective – choosing to work alongside the natural raw and rugged beauty of ancient technology, natural materials and mythological shapes. The intention of using these universal references to light, primitive survival, architecture & art, symbolism, natural shapes, mythological and storytelling from ancient and cultures throughout humanity’s history is intended to employ a Jungian archetypal celebration, hoping to bring to mind simple, beautiful, sensual responses and power which has been passed through generations. The paintings themselves are designed to be viewed in more than one direction. When viewed from the side and lit, the minerals glow in a beautiful and awe-inspiring contrast to the matte canvas. 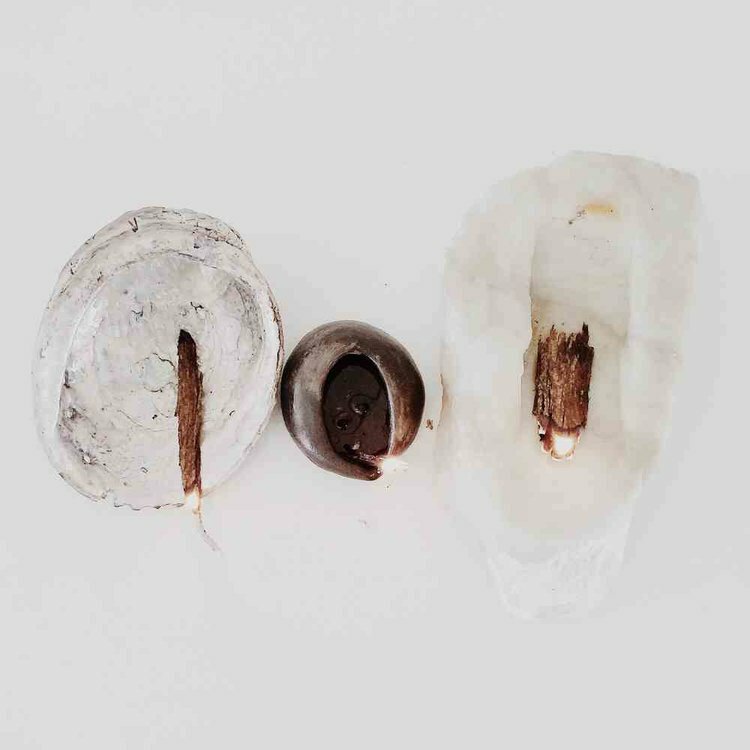 Each mineral is selected carefully and crushed down to a fine powder to be used for its own natural beauty in color and intrinsic properties.